Electrical Apparatus & Machine is dedicated to providing only the best and highest quality electric rotor repair and manufacturing for motor repair shops worldwide. Successful rotor repair depends on the expertise of the company making the repairs. Electrical Apparatus guarantees the quality of our electric rotors and has had much success with repairs since 1974. We have repaired rotors with fractional horsepower up to 10,000 horsepower. In fact, there is no type of electric rotor we can’t repair! To discover the cost of repairing your rotor, contact us today for a quote. You can use the form on this page to send us the information we need and we will contact you soon with more information or simply call us. We immediately record rotor dimensions and runouts when they arrive. Bar material is then removed from the rotor core and analyzed so we may duplicate the original bar conductivity. Copper alloy bars are fabricated to each, individual slot configuration for the tightest interference fit possible. Endrings are welded to the rotor using a specialized process. Rotor dynamically balanced to .1 mils. We implement strict quality control standards at each step of the rebar process to ensure perfection every step of the way. We provide technologically advanced rotor repair methods available in professional repair shops today. 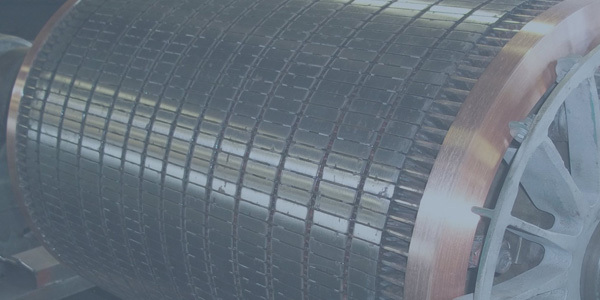 From new laser cut iron laminations of any size to new air vent spacer laminations – we can handle your electric rotor repair.